Koh Larn is the largest of the three inner islands, it has two main dive sites which are both popular. 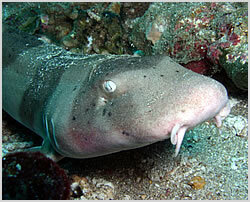 Shark point derives its name from the juvenile nurse sharks that can be spotted hiding in holes and crevaces on the reef. Hard corals drop from the surface down to around 22 metres where a sandy and featureless bottom takes over. The drop off on the western side has a series of coral ledges down to around 20 metres and continues down to over 40 metres although there is nothing to see at this depth. To the south of the island is Koh Larn Vac where there is a sunken restaurant or the remains of one that arrived there by some feat of Thai engineering. Currents can be strong on this dive.